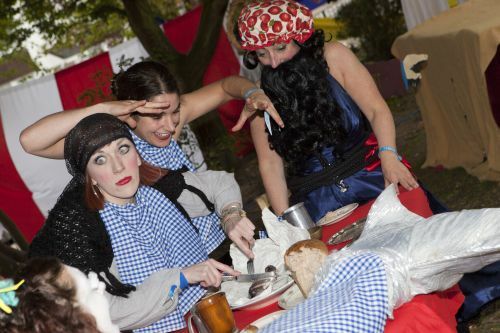 Norwich based theatre company Hocus Pocus Theatre have rapidly established themselves at the forefront of the performance scene in Norwich and beyond, producing quirky and interactive characters for cabaret, walkabout and devised theatre. Started in 2008 by Artistic Director, Lucy Enskat, the company’s first devised showNightmare Cafe was toured across the UK. Widely respected for their innovative and daring approach to theatre they are known for their engaging characters, absurd comedy and unique interactive style. They also regularly produce and perform in their own sell out show, the No Strings Burlesque & Cabaret Club in Norwich. Hocus Pocus Theatre has recently been accepted onto the Arts Councils, « Escalator Outdoor Arts programme », a talent support scheme which will support the development of the company’s new work. Their new show, Sideshow of Curiosities, was premiered at Out There festival, Great Yarmouth, and the company is in residence at Atelier 231, Sotteville-lès-Rouen, from 2nd to 9th March 2011 to develop some of the characters of the show.